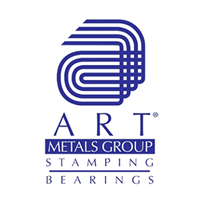 Founded 1943, ART Metals Group was acquired by CM Paula in 2012, and remains privately owned and operated. Art Metal Group has a 40,000 square foot manufacturing facility with approximately 50 employees locate in Fairfield, Ohio. ART serve a diverse global customer base in industries, including but not limited to Agricultural, Appliance, Automotive, Electrical, Military, Large Truck, HVAC and Mining marketplaces. Products and services include metal stampings, assemblies, coined near net shape products, as well as ball and tapered roller thrust bearings. • ART Metals Group is ISO 9001:2000 and ISO/TS 16949:2002 registered. • January 13, 2009 – ART Metals Group (at that time was under the name ART Technologies) of Hamilton, OH, won the prestigious Zierick Manufacturing Corporation Productivity Award, which recognizes a Precision Metalforming Association member company for their outstanding achievement in the development and implementation of programs, processes, and asset utilization that lead to significant improvements in productivity.